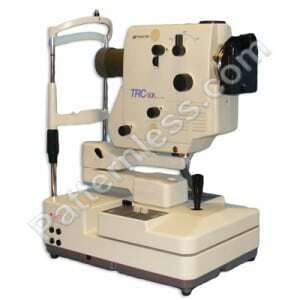 Probably the most common type of ophthalmic equipment for medical use, a fundus camera not only takes an image of the eye, which any high definition camera could do, but is specifically designed to photograph the interior of an eye and focus on specific elements such as the retina, optic disc, macula and of course the fundus itself. To do this a fundus camera relies on the principles used in all ophthalmic equipment that involves the system used for observation and for illumination coming from different angles, this minimizes reflections of the light source itself giving a much clearer image. When studying these images made using a fundus camera it is imperative that a clear image is obtained so any slight distortion or damage to the interior of the eye can be observed. In other applications of ophthalmic equipment as well the level of detail is vital and reflections need to be avoided and this therefore includes medical applications and applications such as engineering and quality testing in manufacturing. With many diseases that affect the eye spotting the problem at an early stage is essential and this could lead to the patients sight being saved. As the level of detail and precision of fundus cameras improves diseases are picked up more frequently with Glucoma being the most common condition to be identified this way and myscopic or macular degeneration two of the most important conditions to catch at an early stage. Modern fundus cameras are of course digital and can therefore display an image immediately, this allows the optician to know whether more images are needed and has also bought down the cost of using a fundus camera, once it has been purchased. 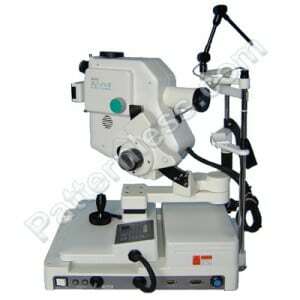 The lens in fundus cameras remain the most important part and need to be perfect to zoom in on the microscopic detail within the eye while still keeping a clear image, it may be no surprise then that the main manufacturers of these cameras are the likes of Zeiss and Canon as well as Topcon, and Kowa. Most fundus cameras have a range of movement of 30 to 50 degrees and so are placed very close to the patients eye, magnification is typically at 2.5 times but can be as much as 5 times. Though the systems for observation are different the illumination for taking the image must line up to ensure the image taken is the same as that the optician sees prior to pressing the button to take an image. While some cameras use mechanical systems to achieve this most are electronic computer controlled systems and the control systems to focus and position the camera may use a control stick or computer software rather than traditional knobs and dials. Modern Fundus cameras are designed to be easy to use with images automatically stored and displayed on a connected computer and with auto zoom, focus and alignment features, the opticians skill now really comes when studying images to identify problems in the eye.